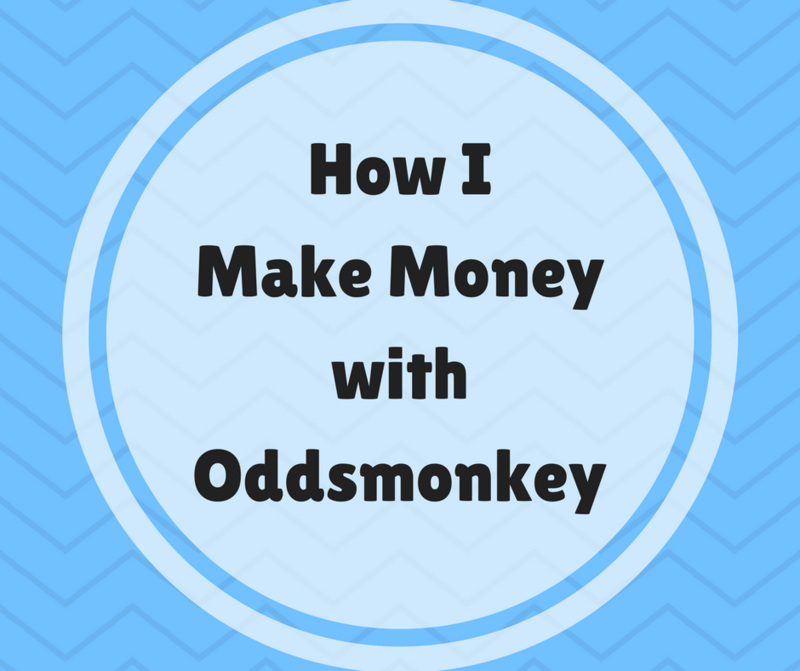 I’ve talked about Oddsmonkey before, and I know it can be really difficult to understand how matched betting works without having any visual aids. I don’t often see the people explaining it showing their audience exactly what it is that they do. This is part of the reason it took me so long to figure out exactly what goes on and decide it actually was worth my time. This article will explain exactly how I made my money this weekend. I must admit, I did a bit of cheeky working out and decided not to match my qualifying bet, but you’ll see why in a minute. David Haye fought Tony Bellew at the weekend and there were loads of great odds about for Bellew to win. I had a strong hunch about this (never a great place to start when you’re doing calculated betting, never make emotional decisions). I found the odds I wanted (6/1) with SkyBet and wagered £10 on Bellew to win and earned two £10 free bets as part of the sign-up offer. 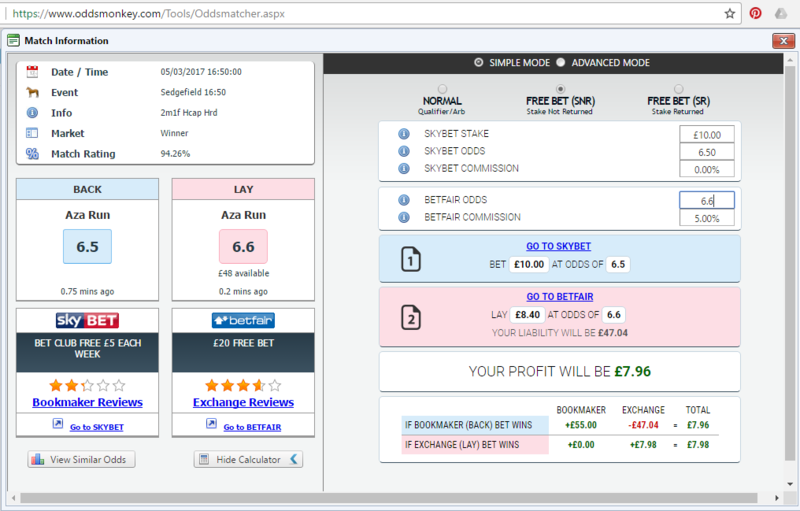 Normally, you would match your initial bet in the exchange (Betfair) so that you don’t lose any of your money, but since I was making a leisure bet that had sort of turned into a matched bet, I didn’t bother. I also knew that the free bets I’d get in return would make me some money, making the £10 I was betting on Bellew to win completely risk-free. Luckily, Bellew won and I won £60, got my £10 stake back and earned two £10 free bets. This is where I make the free bets into real money. Next I went on Oddsmonkey and used the calculator to see which bets would match closely (at 90% or higher) and have odds in decimal form of 5 or over. Here’s the calculator for the bet I chose to do. So this screen tells me lots of things. On the left hand side, we can see that we’re dealing with SkyBet and Betfair and the event we are betting on is Sedgefield at 4:50 for Aza Run to win in the SkyBet account and to not win in the Betfair account. 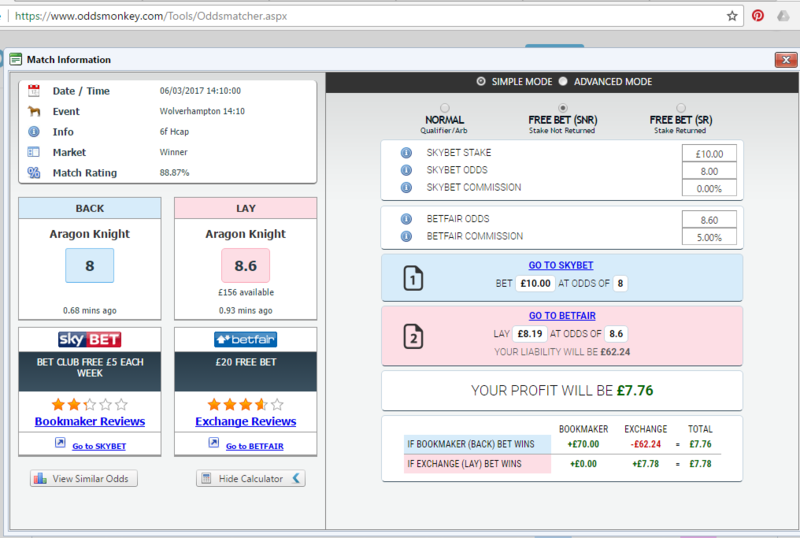 On the right of the screen, the box in the middle is ticked for ‘Free Bet (SNR)’. SNR= Stake not returned, which means you don’t get your stake back on your free bet, even if you win. In the blue part, it tells your to bet £10 with Skybet. In the pink it tells you how much you need to lay using your Betfair account. In this case it’s £8.40. Below that is the calculator that shows you your guaranteed profit from this transaction. What I like is that the workings out below, showing you how this number is achieved. This is what I did with my second free bet, see how easy it is to understand once you’ve had a proper look. So the total I’d made from my initial £10 bet was £75.42. This was £60 from my first bet, then the profit from my free bets added together. Today I got what’s called a ‘reload offer’. If I bet £10, I’d get another £10 bet. I wagered my first £10 and the best match I could get lost me 34p. The free bet then worked out as £7.86. £7.86-34p =£7.52. So from Saturday I have made £82.94 from just betting that £10. That’s how matched betting pans out when you haven’t got a large amount to bet with. If you do it this way and spend 10 or 20 minutes a day doing it, you can take home £300 a month with almost no effort! I’d love to hear your feedback on this. Are there any areas I could explain better? Is there anything you don’t understand and would like me to answer a post on? Let me know in the comments! I am intrigued by matched betting but I have spoken to my husband and he is less keen. I’m not sure why but he did explain…. I think I shut off 😉 I’m glad it is working out for you though. It’s a lot easier if you have a website telling you what to do!